During my Stephen King-reading streak, which spanned more than a few years, if it had the author’s name on it, even in reference, it got my attention. Whatever it was. Hey, I was once an official Book-of-the-Month club member and knew no bounds. Evidently, publishers had become eager to namedrop Maine’s prominent literary talent to hook potential readers in another marketing ploy. By the early 80s I came across one of these recommendations concerning a book King thought pretty ferocious. Really, I thought? 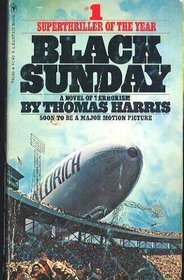 Its author, the reclusive Thomas Harris, I recognized as the one who wrote the 70s terrorist thriller Black Sunday. I’d seen John Frankenheimer’s 1977 film adaptation back in the day and had subsequently read the book it was based upon. A taunt work well-worth the time. Hmm…maybe if it piqued the horror-meister’s awareness, maybe this 1981 book merited a gander, I innocently presumed. Boy howdy! I’ve no doubt someone else wrote about serial killers prior to this, and perhaps an odd story or two about criminal profiling surfaced somewhere in print earlier, too. Crime-fiction writing so well-worn a path for it not. 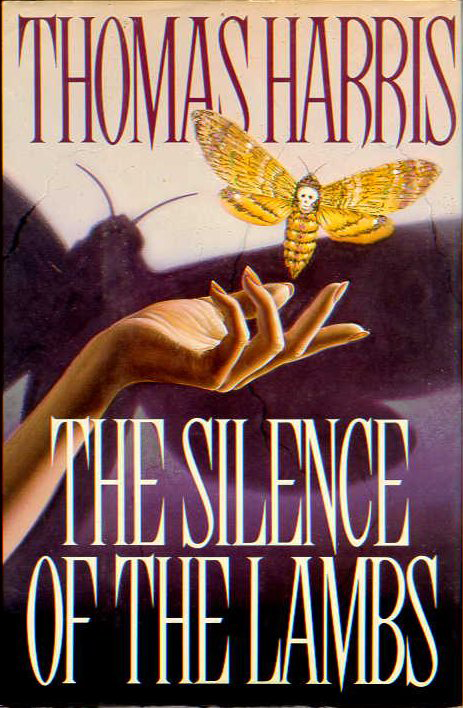 However, no one ever put them together before into a novel like this work by Thomas Harris. Cloaked in the garb of a procedural, with a captivating character-driven plot, and crafted with horrifying believability. Of this I’m pretty damn sure. The novelist skillfully wove behavioral science, detailed butchery, with a technological edge, into an unsparing story. Chasing down, and interacting with, human monsters. Uncommon creative writing at the time that was realistically frightening. The stuff of nightmares, and it gathered admirers from both the crime thriller and horror realms. 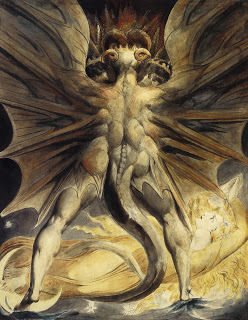 Back then, readers and publishers knew Red Dragon was the one that set a new mark. The story traced a serial killer nicknamed “The Tooth Fairy” who stalks and kills seemingly random families during sequential full moons. Two days after the killer’s most recent set of murders, FBI Agent-in-Charge of the Behavioral Science Unit Jack Crawford enlists his troubled, scarred, and former protégé for the case. Will Graham was a brilliant profiler who initially captured the most famed serial killer around three years earlier. Hannibal “The Cannibal” Lecter. For his effort, he retired after Lecter almost killed him. The gist of the story was how Graham goes about finding his quarry, using the dark gifts Lecter knows only too well to do so. 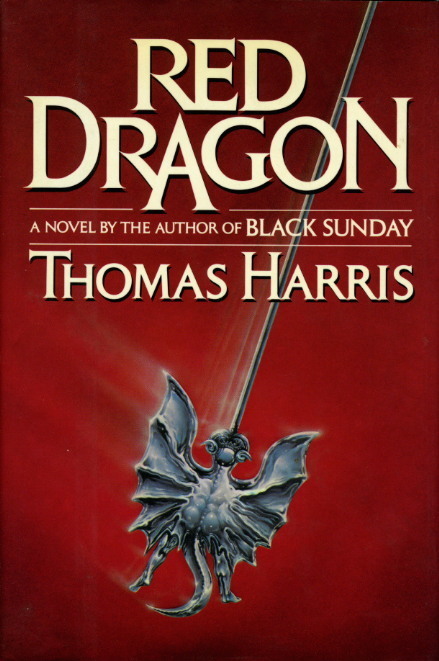 In my opinion, there was what came before Red Dragon, and those that copied Harris’ unique amalgam from that point afterward. Thirty-three plus years later, the field has now been plowed many times over. Yet, I listed the book here as a forgotten precisely for that very fact. Of sorts, it created its own subgenre. A minor but darkly beguiling character — or hellish creation, take your pick — in this novel, Hannibal Lecter would eventually become the primary anti-hero protagonist in subsequent books. Dominating the author’s work, his chronicles intrigued many, including imitators. Over the years, Lecter had almost become a target for parody because he has been re-done and re-imagined (even in female form) so often. The trend has only grown for novelists, TV writers, and motion picture screenwriters in the days since. To the point they seemingly can only attempt to out-eviscerate Mr. Harris’ signature rogue in gore and depravity. With diminishing returns, sadly. It’s a cliche to come up with a scenario about a charismatic or sinister serial killer in the publishing world or whatever sized screen you write for these days. That’s why this novel deserves its due. Truly, Red Dragon was the forerunner. Owning to the fact this story and villain, at least for a time, was intensely original. Still, imitation remains the sincerest form of flattery, along with the primary business model for publishers and movie studios. As mentioned, the book’s influence expanded beyond the literary. What was the novel’s best film adaptation, you ask? Since it was done twice for the big screen, easily it’s Michael Mann’s 1986 Manhunter, I’d say. Although, its 80s pedigree is manifested somewhat in its art direction and depiction, this film clearly did not waste its fine cast as it told its potent story using director Mann’s well established and creative approach. Contrast that with what hack director Brett Ratner tried to do with his 2002 remake. Of late, the best and most novel approach with the material has come from television, of all places. NBC’s Hannibal series, with the intriguing Mads Mikkelsen carrying the demented torch as the signature character, and Hugh Dancy’s Will Graham, has created a startling reinterpretation of the author’s characters. A program that’s gathered old hands of Thomas Harris’ work along with new followers who’ve only been exposed to his mimics. Quite a feat. So far, it’s a wonderfully written, acted and directed series that’s transcended the inevitable comparisons, yet still serves up an admiration to the source material. A remarkably bloody one for television audiences. Red Dragon remains an exceptional headspring that hasn’t received the accolades it’s long deserved. It may be that its sequel, The Silence of the Lambs, overshadowed it by bringing Lecter further forward on text and later film1. Pairing him with a more divergent and fascinating foil, the young Clarice Starling. I should note for those drawn to the character, wanting to go deeper into the topic that is Hannibal Lecter to explore his legacy and impact upon popular culture, check out author John Kenneth Muir’s insightful retrospective post on the subject. It’s an engrossing read. Lastly, as good a film as Manhunter was, I’m afraid no film adaptation was ever as gripping or harrowing as the book that intrigued Stephen King. To be certain, no film ever dared put Red Dragon‘s shattering climax from the page onto any of the two screen adaptations. Admittedly, the bloody calling card for the new TV series is one that it isn’t afraid to do just that or similar. Time will tell. It’s the reason I’m listing all this together with Thomas Harris extraordinary second novel, here — the author only wrote five in all before falling off the publishing map. Why the book is worth reading and remembering, I guess. As long as you can handle the nightmares, that is. EXCELLENT piece here Michael! I absolutely loved this book, Harris writes very well, and he managed to balance all the aspects of this. I am a huge fan of the movies and the series and, of course, of King 🙂 This was a great read! Thank you very kindly, Zoë. Yes, it’s a great book that really hooked me to line of characters and everything that sprouted from it. Thomas Harris a wonderful writer, one I’d wish would get back into the field. Completely missed out on Brian Cox’s performance from ‘Manhunter’. I assume you approved of it? I can see why you’d like Thomas Harris. It’s a demented, thrilling plot. The trilogy worked for me on the screen even for it’s holes. Fiennes — such a complex character — I kept thinking of Anthony Perkins when I watched Fiennes at the house at the climax. Anyway, interesting post, Michael. 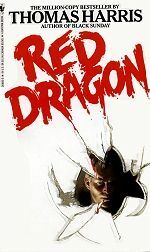 Nicely written Michael, I read Red Dragon after The Silence of the Lamps and Hannibal and I thought it might be better than those sequels. I’m not a big fan of Mann’s film version and Ratman tried his best at becoming a decent director but again the film fell short. You’re right, NBC’s Hannibal pretty much captured the mood that I felt while reading Harris’ books. Last season’s finale was shockingly brutal and I loved it! Great to have you chime in, Ted. Glad to hear your appreciation of Red Dragon. I understand you concern with ‘Manhunter’, too. The ‘Miami Vice’ TV program’s influence on Mann does come across in this film. That works or does not for viewers. No in-between. Great to know you’re into NBC’s Hannibal. Agreed about it tenor. My wife couldn’t get past the first shows, though. Too much intense and bloody for her tastes. Yep, that was a shocking and brutal finale, alright. I loved the Michael Mann version, even (surprisingly) more than the book. William Peterson will forever be the one and only Will Graham for me. My favorite scene is in the hotel when Peterson is watching the video of the slain family, thinking out loud his way into the killer’s mindset, and watching Dennis Farina back into a corner in horror and disbelief at what’s coming out of his friend’s mouth. So funny to see this post. I was away on business this week and I am currently running down the homestretch of RED DRAGON’s last 100 pages. I read a good deal of it on the plane. I had seen the film many years ago. 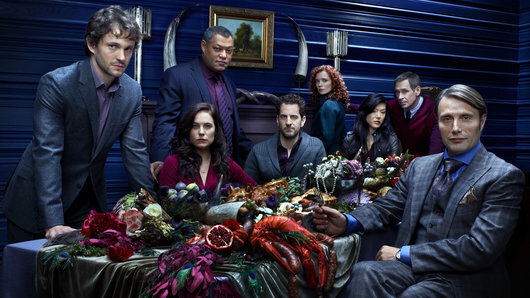 I have since become a massive fan(atic) of Hannibal the TV series. It was that series and the projected arc of that run (which I hope continues for at least five seasons) that made me go and buy up Red Dragon, Silence of The Lambs and Hannibal to read. In fact I’m itching to watch Manhunter and Red Dragon all over since reading this book. I hope to watch them very soon now. There is something about the world created by Thomas Harris that is unsettling and real and believable. His details are perfect. His descriptions of a moment can be dreadful. Also, as monstrous as the Tooth Fairy, ultimately the Dragon himself, is, Harris makes him fairly sympathetic for a number of chapters and really builds the back story that gives you an understanding oh how Francis is the creature he is. It is the sense of isolation and rejection. He was repelled and thus he has become a monster. The book is really something. For anyone who visits your post that hasn’t seen the TV series. Stop and go buy it now. It needs your support and it deserves it. Agreed. It’d be a great time to revisit both film adaptation of this work. Harris really crafted a superb set of characters and placed them in an unsettled world. And yes, he made the ‘Tooth Fairy’ a very real and understandable character. Love how Graham described him (in novel and film). Really interesting post. Has been fascinating to see how the TV show Hannibal has adapted the characters. Were you worried it would be bad or did you always have faith? I very much had my doubts going in. The show really turned them around, and fairly quickly, too. I had a good feeling when I saw the cast but it is far from a foolproof system. It would be cheeky to link it on your site, but I posted a line on my site. As insightful as Will is, I think Hannibal really does get the best lines. I’ll check it out! Thanks for the heads up. Great post Michael – one could argue that the ending of the book got nicked and used as the climax for both Dario Argento’s OPERA and the end of season 1 of that fairly daft Kevin bacon show, THE FOLLOWING – and King as has certainly been something of a media tart, lending his imprimatur to so many book covers (rather nicely, I think my edition of SILENCE OF THE LAMBS has comments from Roald Dahl on the cover). I have only seen the first season of HANNIBAL so far, but it has certainly exceeded my expectations.